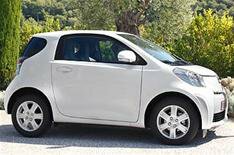 Driven: Toyota iQ | What Car? Even Toyota admits its cars are bought for logical rather than emotional reasons, but it reckons the iQ is going to change all that. Fitting four seats in a car that is under three metres long has posed numerous technical challenges, but the solutions have resulted in something a bit different. It drives surprisingly well. The 67bhp 1.0-litre engine is punchy enough for the city, and keeps up on the motorway. Its clean, too, averaging 67.3mpg and emitting 99g/km of CO2 with the manual gearbox, making ownership VED road tax free. Insurance costs are also low, so running costs are attractive. There are downsides to the small engine, though: at times it needs to be revved hard, and noise intrudes into the cabin. Thats also joined by wind and road noise at higher speeds. However, the iQ copes with bumpy roads admirably, and the direct steering and tiny turning circle add to its appeal. So, too, do the safety provisions, including numerous electronic aids and nine airbags. Inside, clever design allows for a cut-sized dashboard that means the front passenger can sit farther forward, giving a rear seat passenger more room. Toyota says two people of 190cm in height can easily sit behind each other. However, when it comes to fitting a passenger behind the driver, the iQs designers seem to have run out of clever ideas. Unless the driver is tiny, its nigh-on impossible. In reality, the iQ is a three-seater and one with next to no useable luggage space at that. There are also problems with the interior plastics, which in many places are rock-hard and tacky, and the drivers seat and steering wheel adjustment, which are limited. In a budget car youd accept that, but the iQ is far from cheap, with prices starting from a whopping £9495. Sure, its loaded with kit that pushes the price up, but all the gadgets in the world cant hide the poor interior. As a result, the iQ is flawed. In many areas its clever, quirky and appealing but the shortcomings suggest that Toyota is hoping buyers will be swayed by their emotions because they are unlikely to buy with their heads.